The world is now hotter than at any stage since prehistoric times, a top climatologist announced last week. His startling conclusion comes as NASA reported that 2005 has been the hottest year ever recorded. Dr Michael Coughlan, head of the National Climate Centre at the Australian Government's Bureau of Meteorology, said: "One probably has to go back into prehistoric times - and way back in them - to be seeing these sorts of temperatures." Top British climatologists agree privately but are cautious of saying so in public because, naturally, no measurements were taken of temperatures then. Dr Coughlan is supported by research that shows carbon dioxide levels in the air - the main cause of global warming - are higher now than at any time in the past hundreds of thousands of years. Scientists in Bern, Switzerland, and Oregon in the United States analysed levels of the gas in tiny air bubbles trapped in Antarctic ice during the past 650,000 years. They found current levels were 27 per cent greater than the highest level over that period. Professor Sir David King, the Government's Chief Scientist, has said the last time levels of the gas were that high was 60 million years ago. And that was during a period of rapid warming in the Palaeocene epoch, which caused a massive reduction in life on Earth. Meanwhile, top climatological bodies around the world report that 2005 is vying with 1998 as the warmest year on record. NASA says it just beats it, while the Met Office says it is just behind it, and the US government's National Climatic Data Centre says the two years are statistically indistinguishable. The massive 100-mile long Antarctic B15A iceberg broke off the Ross Ice Shelf in 2000 and drifted into shipping routes to McMurdo Station. It appeared intact in a NASA image in October 2003, and then two days later broke in two. 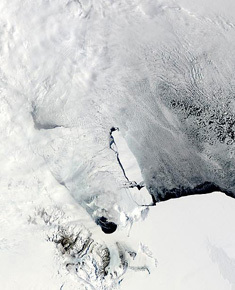 It was one of the largest icebergs ever observed breaking from the shelf. Whichever is right, 2005 has been a remarkable year, for 1998 was made much hotter by a strong El Nino, the warm Pacific current that strongly affects weather around the globe. Last June, September and October were all logged as the warmest ever, world-wide. The past 10 years are all in the warmest 10 ever recorded, apart from 1996 whose place is taken by 1990. This year Arctic sea ice dropped to its smallest ever extent, the Atlantic suffered a record hurricane season and an unprecedented drought reduced the flow of the Amazon to its lowest ever level. Canada and Australia had their hottest ever weather this year, while India, Pakistan, Bangladesh and Algeria suffered heatwaves touching 50C. Copyright © Independent News & Media. This article was first published in The Independent 18/12/05.